Step 1 Thaw the puff pastry for about 20 minutes. Heat the oven to 400 degrees. Step 2 Meanwhile, bring the broth to a boil in a 1-quart saucepan. Add the carrot and cook until crisp-tender, about 10 minutes. Using a slotted spoon, transfer the carrot to a plate and set aside. Remove the broth from the heat and set aside. Step 3Heat the butter and oil in a 10-inch skillet (or cast-iron skillet, if using) over medium heat until the butter foams. Add the onion and cook until it begins to soften, about 2 minutes. Add the mushrooms and cook until they just begin to brown, about 3 minutes longer. Sprinkle the flour over the onion-mushroom mixture and stir to blend in. Slowly stir in the stock, bring to a simmer and stir until smooth and thickened, about 2 minutes. Add the cream, stir to blend and bring to a simmer. Add the reserved carrot, the turkey or chicken and the parsley. Stir to combine. Return the mixture to a simmer, then add salt and pepper to taste. Remove from the heat. If not using a cast-iron skillet, transfer the filling to an 8-cup baking dish that's 2 inches deep. Step 4Unfold the sheet of pastry and lay it flat on a lightly floured work surface. Roll out the puff pastry into a 10-inch circle, trimming the corners with a paring knife to form a circle. Cut 3 slits, each 2 inches long, in the center of the dough. Carefully place the dough over the filling, centering it in the dish. Lightly press the edges of the dough against the sides of the dish. Bake the pie until the dough is nicely browned, about 25 minutes. Serve immediately. In Recipes-list.com we have selected the most viewed recipes from category - Leftovers Main courses . Enjoy the best recipes specially selected for you! 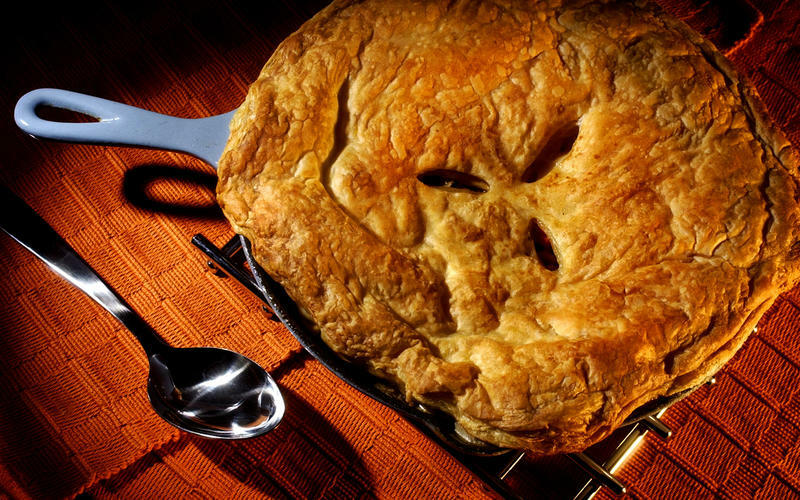 Turkey or chicken potpie is the right choice that will satisfy all your claims.